Artists like Therese Lahaie craft completely new things from the mundane. The goal of her project, “Crossing Signal Mosaic” was to take ordinary urban icons that govern human activity, like streetlights and crossing signals, and by slowing them down, transform them into the extraordinary. Just like actual pedestrian crossing signals from your local intersection, LED lighting was used for the Crossing Signal Mosaic project. The imagery is abstracted like a contemporary illuminated painting composed of saturated colors like you would see in a stained glass window. The way she describes it is pretty cool: “transmitting light through glass as a canvas”. We designed aluminum boxes that house 4 independently controlled projectors, which project her images onto a glass screen. The glass is covered with projection film so the images are crisp, clean, and easy to see. The light source is a 9 watt RGB LED spotlight projecting a 4” diameter Gobo stencil. We made the custom projector based on size constraints (housing, light engine, etc). The light source gives enough power so the images are visible even during the day. What’s a “gobo”? Thanks to Wikipedia for a definition. The term gobo is derived from “Go Between” or “Goes Before Optics”. It’s a physical template slotted inside, or placed in front of, a lighting source, used to control the shape of emitted light. The term “gobo” has come to generally refer to any device which produces patterns of light and shadow or various pieces of equipment that go before a light. If you go to concerts or night clubs, chances are good you’ve seen a light show using Gobos. Some of American Idol’s live events featured them and they’re commonly used in advertising by big brands (Ford and Coca Cola for example). The technology has been around for decades. In fact, some people consider the original “batman” signal projected up into the sky is the first ever Gobo! The real work and artistry is in the production of the light show. Similar to the engineers at NASA as they work with astronauts, Therese trusts us to give her the tools and instruments to develop a production; which would include the lights, the gobo projectors and most importantly, the controller and software. Our goal was to make the user interface intuitive and easy to use. She just knows she has to click a button and it responds! A user-friendly interface enables her, a lighting engineer or theatrical designer to do their job. Creating an amazing light display is like conducting an orchestra. When they orchestrate a light display, they’re telling a story with light instead of sound or pictures. 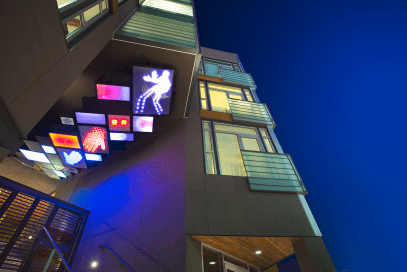 Located in the lobby of a new 125 unit apartment complex in Emeryville, California, it amazes the residents and visitors there.